Blake Van Zile | Stahancyk, Kent & Hook P.C. Utah Legal Services and Legal Aid Society of Salt Lake, assisting victims of domestic violence, and completed a judicial internship with the Honorable Judge Keith Kelly, Utah’s Third Judicial Court. Blake is a member of the Washington State Bar, Washington State Bar Family Law Section, the Clark County Bar Association, and the Clark County Inns of Court. Blake is active in the Clark County Volunteer Lawyers Program and volunteers at several legal clinics in Clark County. In her final year of law school, Blake served as the Student Director of Salt Lake City’s Family Law Clinic, helping up to fifty clients per clinic. Blake also represented pro se litigants in Utah’s Third District Court under the third-year practice rule. Blake enjoys spending time with her family in Seattle, fitness, cooking, and spoiling her French Bulldog. 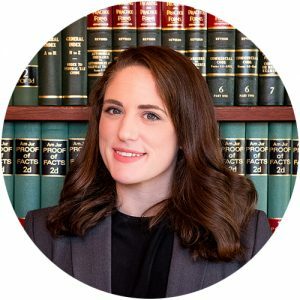 As a second-year law student, Blake received the Outstanding Achievement Award in Juvenile Courts, as well as the John Farr and Ann Clayson Larson Family and Juvenile Law Scholarship for her commitment to family law.